The pursuit to simplify storage in your PC or small office server is a feat not easily accomplished. Patriot’s engineers have developed an solution for some users with the Convoy 425XL. 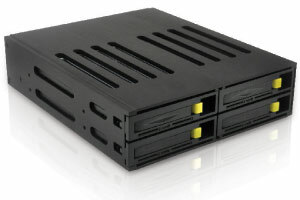 The Convoy 425XL is a 5.25” SATA storage enclosure which holds up to four drives in a hot-swappable configuration. The Convoy 425XL has a four drive built-in backplane which supports several RAID configurations. Since the backplane will accept SATA drives, the user has the option to plug in spindle drives and/or solid state drives. Some computer cases on the market today may come with one adapter to mount a 2.5” drive but almost none include support for more than one let alone four. Given the speed and usefulness of current SSD drives and the fact that they typically come in a 2.5″ form factor the Patriot Convoy starts to become rather appealing. Let’s take a closer look at what the Convoy 425XL has to offer.